I’ve noticed Nita Wall has added some names to the Coca Cola Police post below (click on comments). If you’re not clicking on comments, you’re missing out on more than half the action. Well, I must never have left the Doll Show portion! Have no memory of riding....or even seeing this part. The photo is such a classic ("Little Rascals"-style).....with the boys climbing up on the fence. So hope some of you will be able to identify yourselves, or any of these in the photo. 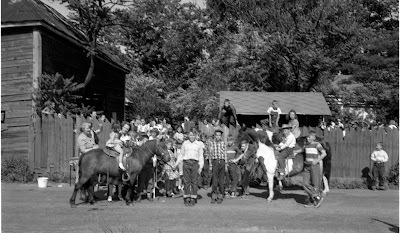 Especially wondering about the so-at-ease girl to the right, on the tallest pony(horse? ), and that boy all "ready" with his cowboy hat. Look at the older boys assisting, the nonchalance of the one on the right!